​Julian Rocks, 2.5 km from Byron Bay's shore consists of ancient sedimentary rock, remains of a volcanic eruption more than 20 million years ago. 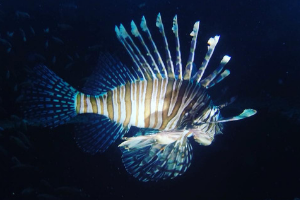 It is an extension of Cape Byron separated by water and forms a most unique marine reserve, providing shelter and food for more than 500 tropical and temperate fish species alone! 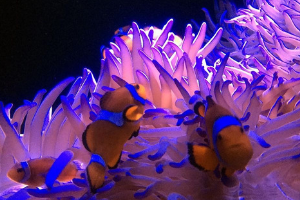 The marine life is incredible all year round. Grey Nurse sharks can be seen during the Winter months, Blue Tang visit in Spring and species such as Leopard Sharks and schools of Trevally can be seen during the Summer months. Don't forget about the Wobbegong Sharks, Octopus and Moray Eels. Of course there are Turtles, small and large, in fact, there so many species of fish and marine animals it is impossible to name them all here. 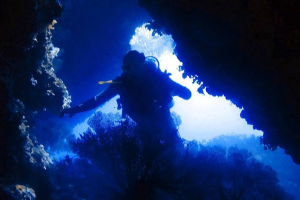 The best way to experience this amazing dive site is to come along and see for yourself. This amazing adventure includes a double dive on the beautiful Julian Rocks, return transfers to Byron Bay and lunch. 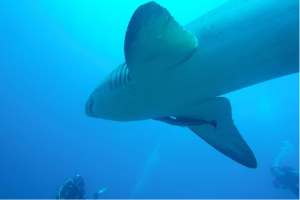 Dive with Grey Nurse Sharks, only minutes from Mooloolaba! See these beautiful gentle giants up close and personal. 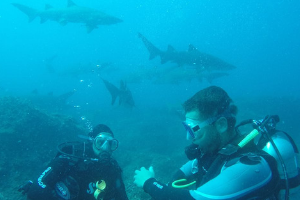 Shark Dives are seasonal and generally operate in September & October. 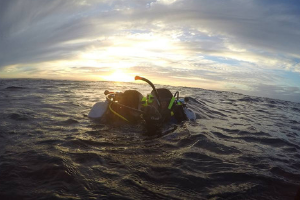 "Great variety of dives... the most adventurous on the Sunshine Coast for all levels and qualifications!"